Yes! The joggette at lunchtime last Wednesday perked me up a treat, it was a beautiful day, that makes such a difference doesn’t it? 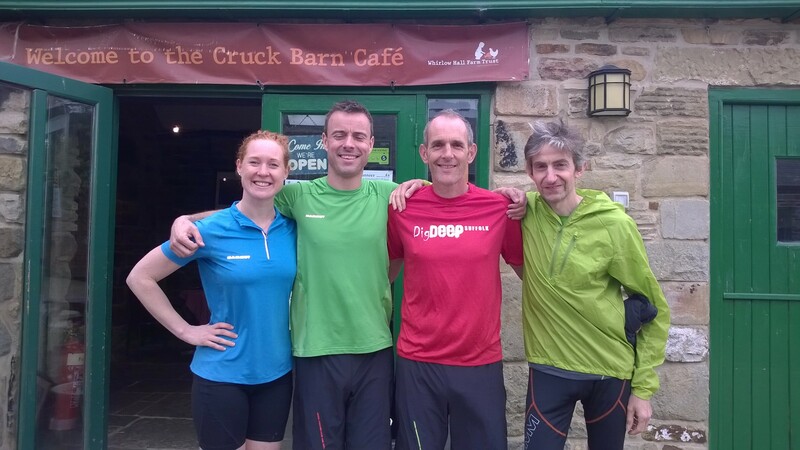 Then I had the pleasure of running 5 miles with the guys from Dig Deep Races in association with Mammut as we’re partnering with them to promote their 15-16 Aug weekend at Whirlow Hall Farm, Sheffield. It sounds brilliant and I hope to see lots of Trail Running readers there. Me with Rob from Mammut, Ian from Dig Deep and Jez from Outside store Sheffield, off for a 5 mile recce of the 12.12 mile race route. It was lush, lots of paths, fields and riverside running with plenty of hilliness. Can’t wait for the race! I’m particularly pleased to be involved because there is a race for everybody, so I’m going to get my local running club, the Stamford Striders, training for either the 10k, 12.12miler, Intro Ultra 30 miler and Ultra Tour of the Peak District 60 miler. I think I might go for the 30 miler, then maybe I’ll bob along on the 10k or 12.12miler on the Sunday at a nice slow pace to chat to folk, who knows what I’ll be capable of after my crazy Costa Rica race training! Ahem, so, I’ve fallen off the wagon in terms of the 1500kcals/day diet plan my coach Rory Coleman would like me to follow, I think I managed twice that yesterday in a roast dinner but to be fair I didn’t eat anything else that day. And the training, well after these two mid-week runs, my running club friends heard my coughing (in the pub on Fri, don’t tell Rory, I only had 1 pint tho) and advised me not to do my usual 10miles Sat and 20miles Sun on my training plan. They said, “How about, Claire, that you just rest this weekend, get over this cold properly, then come to club on Tues and start from there properly well again.” And I have to admit, between coughing up phlegm, that it did seem like an achingly sensible idea. So I did it. I’m not running today either 😦 but I feel like my cold will be fully gone by tomorrow, and I feel the need for a good stretch so I’m going to do some moves from Yoga for Runners by Lexi Williamson, who has given us some powerful injury-prevention poses for the next issue of the mag (on sale 6 Nov if you’re interested). Next Next post: Warm out isn’t it?